Originating in a time when rooms were heated by open hearth fires the classic wing chair came into existing to protect the user from the draughts that inevitably come with this form of heating. Windows were also a source of draughts with ill fitting frames as well as "leaded light" glass panes. With its large wings mounted on the armrests the chair is designed to enclose the head and torso of the person sitting in it. Designed to provide comfortable protection from draughts, and particularly to trap the heat from a fireplace in the area where the person would be sitting. From this it can be seen why in times past these are most often used near a fireplace, just as they were as early as the late 17th century. The basic design of a wing chair is of course similar in that it has the comforting wings but there are many styles or types of wing chair. 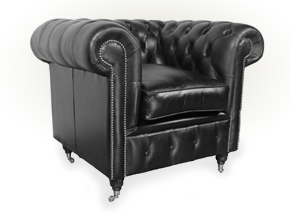 One of the most distinctive is the Queen Anne which is a timeless piece of handmade leather furniture from English furniture manufacturer Distinctive Chesterfields. This is described as the original high backed wing chair complete with contoured legs buttoned back with stud facing. Naturally this iconic wing chair follows its predecessors by being covered in hand selected first quality hide which can be antique leather, premium leather or hand dyed leather offered in 33 colour variations. Antique leather is fine in quality and available in ten different colours. With premium leather the grain is finer than the antique range and these leathers feel softer to the touch. The range of colours available is vast, with nineteen standard shades available. With hand dyed leather, this is a time honoured process and a traditional way of leather finishing which has been done the same way for many centuries. In any chair, but importantly a quality chair such as the Queen Anne, the frame is the most important part of this. In this particular wing chair the frame is only made from hand selected knot free beech hardwood and this is assembled by time served craftsmen using traditional methods of dowelling and screwing. There are no short cuts to a beautiful piece of leather furniture if they are to stand the test of time.